Work Smart Furniture Solutions is a company that has manufacturing warehouses strategically located throughout Australia. The Company has a wide range of products for interior office environments including: workstation and desking systems, chairs, storage and detailed custom joinery. They strive for manufacturing excellence with world-class products achieved through continual research and development and is distributed through a network of special partners. Worksmart Furniture Solutions is a company that has manufacturing warehouses strategically located throughout Australia. The Company has a wide range of products for interior office environments including: workstation and desking systems, chairs, storage and detailed custom joinery. They strive for manufacturing excellence with world-class products achieved through continual research and development and is distributed through a network of sepcial partners. 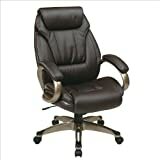 Work Smart office chair ECH30621-EC1 Executive Eco Leather Chair with Padded Arms and Coated Base has a product dimensions of W 28.5” H 46.5” L 28.5”. This chair has a pneumatic seat height adjustment like any other chair. The chair is composed of executive espresso eco leather chair which means it uses a leather that improves environmental performance. This is measured by the absence of restricted chemicals such as banned azo dyes, PCP, formaldehyde and an increasing list of specified brands. The color of the leather is cocoa which is a color that does not stain easily. The chair is very customizable since it has a pivot tilt with tilt tension and tilt lock. It also allows you to tilt the chair back but not in a reclined position. For maximum comfort this chair has thickly padded armrest, cushioned seat, cushioned back, and a lumbar support. The thick cushioned back ensures your good posture at all times. It also has a headrest where you can just lounge around while watching a movie or when you are thinking or relaxing your mind. The thickly padded armrest aren’t adjustable but are positioned at the right angle that your shoulders won’t feel any pains. With its cocoa base and heavy duty nylon base with 5 dual wheel casters it looks very durable which means you won’t need to worry of buying a new one for quite a while. The 5 dual wheel caster makes it very easy to glide around thick carpets. It also has a 360 degree swivel to make it very easy to do tasks after tasks without standing up and moving your chair side to side. As with most office chairs, This Work Smart office chair is a little difficult to assemble, having an extra pair of hands would help a lot. Estimated time to assemble around 15-30 minutes. With its price, you are not going to get the finest leather but the stitching is very strong so its very durable and will hold up well. This office chair is also certified by Greenguard. Greenguard certification ensures that a product has met some of the world’s most comprehensive standards for low emissions of volatile organic compounds into indoor air. The Work Smart office chair is already a fair deal with its price in Amazon as most office chairs nowadays are very expensive. If you are looking for a comfortable, durable and very stylish office chair, I would suggest putting this in your list of considerations. It is looks very professional and would look great for your executives. It has a 4.5 star rating from consumers of Amazon. All the reviews are like having hundreds of really good friends give you their personal experience with the chair, then taking all of that personal experience and giving it an easy to understand star rating. You know you're buying quality when there are hundreds of fans of the product. Your local office store has a limited selection. On top of that, most of the chairs they sell are their store brand, meaning you get fewer choices and are paying more for a lower quality chair that they make maximum profits on. Returns are easy. Amazon recently shipped a car, and they ship a ton of large items, all day, every day. If they can ship a car, rest assured, you will get your chair in perfect condition. BUT, if for any reason it comes damaged, it is super easy to return. Just print out a UPS label, slap it on the box and a friendly UPS driver will pick it up, free of charge. This is way easier than waiting in a return line at Office Depot and talking with a bored, angsty teenage sales clerk. My story starts with horrendous low-mid back pain. I had an expensive $200 chair that I THOUGHT was good when I purchased it, but it gave me absolutely no support. I educated myself, bought a new chair and immediately sold the old one on Craigslist for $50. I don't want the same to happen to you, so I created this site. I am currently sitting in a Alera Elusion Series Chair. My dream chair is the Aeron. I love answering your questions, leave a comment or question below!